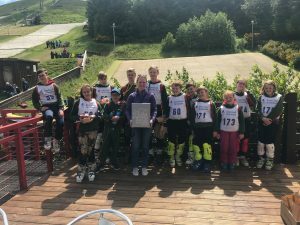 Some good results to report from both Primary and Secondary at the SSSA midsummer slalom event held at Hillend on Monday 18th June. Following a round robin competition the Primary team came 1st in their group and the Secondary team came 3rd. The secondary team (Robert Phillips, Finlay Tungatt, Joe Wadsworth, Naomi Nager, Calum Corfield & Evie Tungatt) were knocked out of the quarter finals by Stathallen. 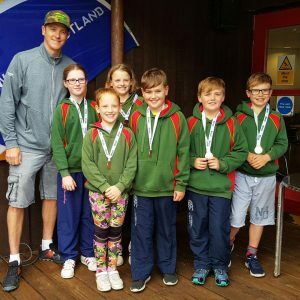 The Primary team (Joanna McKee, Harry Saunders, Ellen Phillips, Charlie Saunders, Anna Phillips & Fraser Corfield) lost in the semi-finals to the eventual winners (George Watsons). They went on to win the 3rd/4th place race to finish in 3rd place repeating last year’s success. The medals were presented by Winter Olympian Finlay Michel. 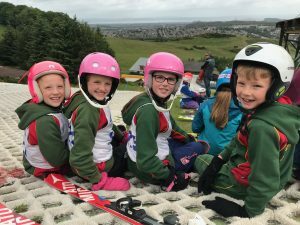 Both teams skied so well and had really great day competing for Jordanhill School. A great end to the school year!